On Tuesday 12th June and Wednesday 13th, the House of Commons considered House of Lords amendments to the European Union (Withdrawal) Bill - the "ping pong" process. The bill is intended to prepare domestic law for the UK's departure from the European Union - ("Brexit"). See previous post 12th June. The list of amendments as put forward by the House of Lords is HERE. Brexit takes place on 29th March 2019 as a result of the withdrawal notice given, under Article 50 of the Treaty on European Union (TEU), by the Prime Minister on 29th March 2017. For the formal parliamentary record see Hansard Online 12th June. I find it very difficult to view the events of 12th June as anything less than an example of law-making at its worst - see Brexit blog - What did we learn from this shameful and shambolic week. A flavour of the day's events may be read at - The Guardian and The Independent. Against the fact that Brexit is the most crucial issue facing the UK since World War 2 it is particularly concerning that the amendments were considered against a "timetable motion" imposing up to 6 hours debate on 12th June and up to 6 hours on 13th June. The timetable motion was agreed by MPs - 321 to 304. Amendment 19 - (Meaningful vote) - would have enabled the Commons to approve any withdrawal agreement and would have allowed the Commons to decide the next course of action if parliament rejected the deal. The House of Lords would have been able to consider the withdrawal agreement. This was rejected 324 to 298. Having disagreed with Amendment 19, the Commons proposed Amendments 19A and 19B. However, there were discussions between the Prime Ministers and certain MPs with the result that further changes are to follow. See House of Commons Library Briefing 15th June - Where are we now on the meaningful vote? and also the article by Liverpool University "Brexit: the end of the beginning" and by the Hansard Society "Debating meaningful votes." A further article at Institute of Government looks at the political calculus behind the meaningful vote issue. The Bill raises serious concerns in relation to devolution and the Scottish Parliament is refusing its legislative consent. The Welsh Assembly gave consent. There was almost no time on 12th June to debate these matters and the deep unhappiness felt by MPs from Scotland and Wales is evident from the Points of Order they raised in the evening. The 13th June proceedings are reported at Hansard Online - HERE. On 13th June the House of Commons continued its Consideration of Lords amendments to the the European Union (Withdrawal) Bill - the "ping pong" process. The political shenanigans began during Prime Minister's Questions when Mr Ian Blackford MP (Ross, Skye and Lochaber) was excluded by the Speaker for the day's sitting. Ian Blackford was angry that in the two days of parliamentary debate only 15 minutes had been assigned to matters affecting devolution of powers to Scotland. This event is reported at Hansard Online. Other SNP MPs also left the Chamber in support of Mr Blackford. The table lists the main amendments and voting in the order in which the House of Commons dealt with them over the 2 days. It's a brief summary only. Sifting committee power to ‘require’ greater scrutiny for statutory instruments, rather than ‘recommend’ the need for greater scrutiny. Statutory instrument procedures following the UK's exit from the EU. 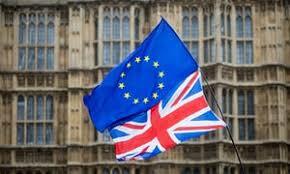 To have required Parliamentary approval of the UK's exit date from the European Union. House of Commons Library Briefing 15th June - Where are we now on the meaningful vote? would have removed power from ministers to decide when retained EU law can be challenged in court. Would have removed a section of the bill letting ministers use directives to decide who is able to challenge the validity of retained EU law post-Brexit. would have ensured that ministers can only use delegated “Henry VIII” powers when “necessary” rather than “appropriate”. Would have restricted ministerial powers. House of Commons agrees with the remainder of amendments in this group without a division. prevents new border arrangements in Northern Ireland and require that ministers must, when exercising powers under the Bill, act in a way that is compatible with the Northern Ireland Act 1998. No changes to Irish border arrangements without the agreement of both the UK and Irish governments. House of Commons votes 321 to 40 to agree with the remainder of amendments in the second group. These amendments relate to devolution. would have called on the Government to make continued participation in the European Economic Area (EEA) a negotiating objective. would have required the Government to seek to negotiate a customs union as part of the framework for a future UK-EU relationship. would have made the Government outline what steps it would be taking to negotiate membership of a customs union with the EU. would have called for the Charter of Fundamental Rights (excluding the Preamble and Chapter V) to remain part of UK law after exit day. sought to remove a clause from the bill that prevented legal cases being brought after exit day on the grounds of a failure to comply with the principles of EU law. would have required that retained EU law in certain areas could only be changed by primary legislation or an enhanced scrutiny procedure. aimed to ensure the maintenance of all EU environmental standards and principles after exit day. The next part of the ping-pong process takes place on 18th June in the House of Lords. The principal focus is likely to be on the "Meaningful Vote"